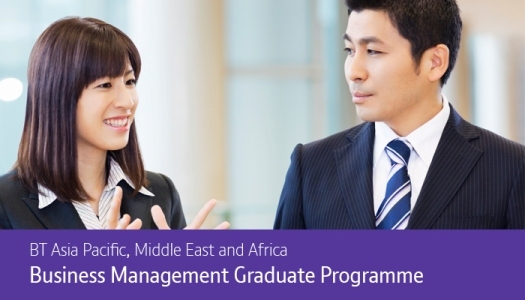 Welcome to the BT Asia Pacific and Middle East and Africa Graduate website. It's an exciting time to be part of BT Asia Pacific and Middle East and Africa region, and we're looking for talented graduates to help us succeed. We're now open for applications for our September 2014 intake. You'll spend two years doing a rotational programme, which will give you the chance to experience different areas and build a clearer picture of where you want to take your career. This could involve developing contracts for our major corporate suppliers or bringing new products and services to market. You'll develop your leadership skills and the ability to balance the competing demands of time, cost, quality, and customer satisfaction. In helping to implement change across our business, you'll need to understand the impact that technology can have on a business, develop a broad, yet in-depth knowledge of BT, have a strong problem-solving ability, and an eye for detail. You'll be helping our corporate customers manage strategic business change from the redesign of their business processes to finding ways to improve the way they work. You'll need to be confident, adaptable, and have excellent communication and influencing skills. Covering the whole client life-cycle from initial contact through to delivery, it's all about enriching our face-to-face relationships with our largest customers. You'll need strong communication skills, commercial awareness and be passionate about improving the end-to-end service to our customers. It's your career, you decide where and how far you go. But we'll give you all the support you need to get there - whether it's training, career advice or encouragement. Our core graduate training is made up of up to 20 days' training across the two year programme. Here are a few examples of the types of courses you can expect to take while you're on the programme. Spend time learning core leadership skills. You'll learn about yourself; how you cope under pressure, and what your leadership style is. And you'll learn how to work in teams under pressure and achieve results through people. Our graduates tell us this is one of the best courses they've ever been on. Spend two days on an intensive presentation skills course, learning the fundamentals of delivering good presentation and receiving real time feedback on your performance. We'll even video you so that you can see how you come across to others and take away some really specific ways to improve. We'll start to prepare you early for leading teams and managing people, equipping you with the basic skills you'll need to effectively manage and inspire the teams you work with to deliver great results. COMMUNICATION SKILLS Improve your communication style and develop the skills to communicate in a way that is straightforward and impactful through our one day communication skills course. Even if you don't want to work in Finance, an awareness of how a business works and the commercial and financial management of organisations is a great asset as you develop your career into a leadership role. Our two day course helps you to understand the basis of financial and commercial management. Get a snapshot of your strengths and skills, and see what impact you have on our business and the people around you. It's a great way to see what your key strengths are, and what your development areas are for the future. Our grads gain a significant amount of skills through their own knowledge sharing and coaching networks, focussing on things like Excel and Powerpoint skills, business and industry knowledge and the BT portfolio - we actively encourage our graduates to work as a community and develop knowledge sharing and coaching relationships with each other.